Responding to consumers’ need for fresh, nutritious snack items readily available to them, the thick blend of fresh fruit is packaged in sleek, bowl-shaped food cans from Crown. The single-serve container includes a separate compartment full of tasty, crisp granola and a spoon, maximising convenience. The fruit smoothies tap into many current consumer trends – healthy eating, sustainability and greater convenience on-the-go. Therefore, brands with designs on a successful year will have to strike the correct balance between the three to fulfil the needs and requirements of consumers. According to Mintel’s Global Food and Drink Trends 2019 Report,“…the definition of sustainability is extending to encompass the entire product lifecycle” and here, in what is being coined as ‘Evergreen Consumption’, Froosh holds all of the cards. Its ingredients are sourced largely from developing countries, where local fruit farms play a major role in helping to build a more prosperous future and the fruit farms often generates better education and health for the people who live in those regions. The fruit smoothie also required a packaging solution that could stand up to the same level of scrutiny as its ingredients. A metal bowl was selected for many reasons, but the fact that the format is 100% and infinitely recyclable and lightweight were key influencers. The bowl also extends product shelf life due to its ability to provide a hermetic barrier between light and oxygen and the product within. 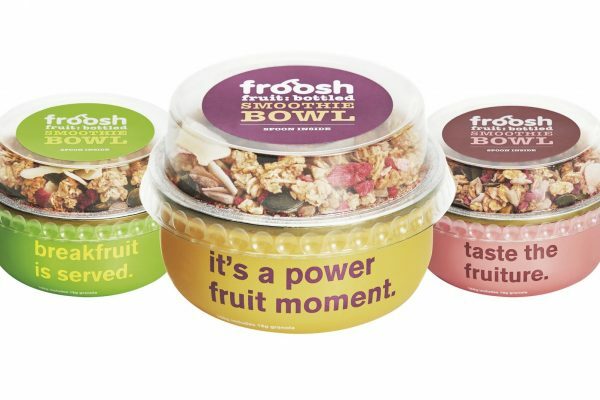 Finally, the container is a new format in the market for smoothie products, placing Froosh at the forefront of packaging innovation – particularly in terms of convenience and ease of use. The collaboration between Froosh and Crown has laid the foundation for a long-lasting, successful relationship – based on a mutual desire to deliver quality, sustainable products that have a positive impact on the world. The fruit smoothies in a bowl are available in the Scandinavian region and come in three flavors: strawberry, banana and grape; peach, passion fruit and vanilla; and pear, kiwi and avocado.